Abhayakaragupta, who lived around the turn of the 11th and 12th centuries and died in 1125, was born in Orissa or West Bengal in India. He is highly revered as one of the last great Indian Buddhist masters who flourished just prior to the Muslim invasion and destruction of the Buddhist monasteries in Eastern India. He was ordained as a monk and skillfully developed mastery of all branches of Mahayana Buddhism, becoming particularly renowned for his emphasis on Vinaya or monastic discipline. His teacher Ratnakara initiated him into the Mantrayana and he received the transmissions of many different tantric lineages. Under the auspices of the Buddhist Pala King, Ramapala, he was appointed to be chief abbot, first at Bodhgaya monastery, then at the monasteries of Vikramasila and Odantapuri. He composed many important texts on Vinaya, Abhidharma, Madhyamaka and logic, as well as extensive commentaries on the Tantras; but probably his most well known works are the Sadhanasagara, the Vajravali and the Nispannayogavali, which describe many mandalas and generation stage sadhanas. It is also likely that he compiled the biographies of the Eighty-four Indian Mahasiddhas, using the name of Abhayadatta as its author. Under his guidance many works were translated into Tibetan, and he was instrumental in synthesizing the philosophy of Madhyamaka with the tantric Mantrayana Path. 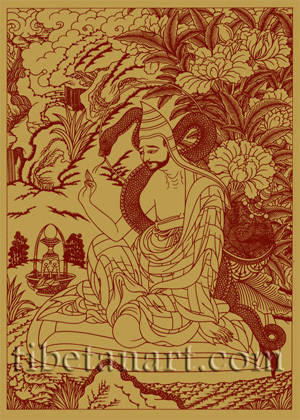 This drawing is based on an 18th century wood-block print from Narthang Monastery near Shigaste in Tibet. The large snake coiled around Abhaya's body alludes to an event when he miraculously manifested a giant serpent in order to subjugate the evil Candalas who practiced human sacrifice. The basket with the phoenix design behind his back contains the Tripitaka or 'three baskets' of the Buddha's teachings on Vinaya (discipline), Sutra (discourses), and Abhidharma (metaphysics). The wish-granting jewel that is in front of him pours forth an endless stream of nectar.